Consumer confidence fell to extremely low levels during the financial crisis. While improving in the 2010/2011 period as economic conditions stabilized and markets rebounded, consumer confidence had still remained at levels previously associated with recessions. Confidence retrenched again in the summer of 2011 when S&P downgraded U.S. debt; however, it has been steadily improving since. 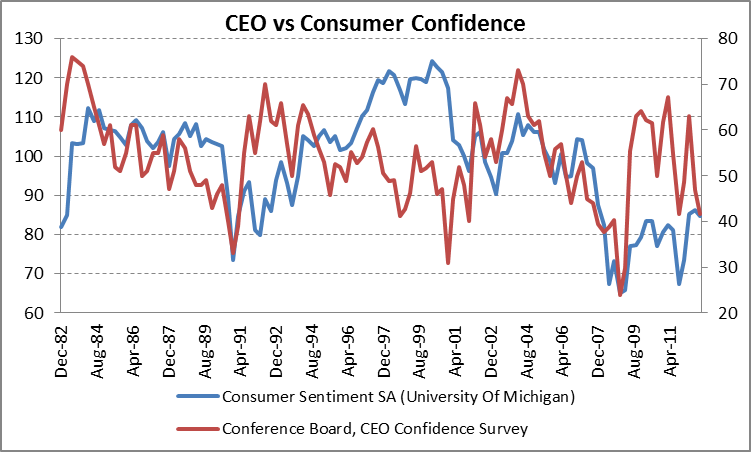 While consumer confidence is strengthening, business confidence has weakened. Companies have downgraded their growth expectations. Despite healthy balance sheets, policy uncertainty in the U.S. is causing companies to hunker down and delay capital spending and hiring. CEOs of U.S.-based companies have urged policymakers in Washington to act “to end the crippling uncertainty that is stifling business investment and hiring” (Source: Business Roundtable). On November 18, the Wall Street Journal reported that “half of the nation’s 40 biggest publicly traded corporate spenders have announced plans to curtail capital expenditures this year or next” (Investment Falls off a Cliff). It is clear that the paralysis in Washington is keeping business investment muted. Until the rules of the game are settled by Congress and President Obama, capital expenditures and hiring will likely remain on hold. Companies have the ability to invest for the future and drive economic growth in the process, but we must wait until fiscal policy uncertainty is removed. While consumer sentiment has improved, we remain concerned that consumers have not prepared for a fiscal drag that may hit next year. Even if a deal is reached to extend a number of the tax and spending provisions for 2013, it seems that there is very little support in Washington to extend the 2% payroll tax cut. Even if current rates are extended for most taxpayers, everyone will see their take home pay decrease as a result of the expiration of this temporary tax cut. 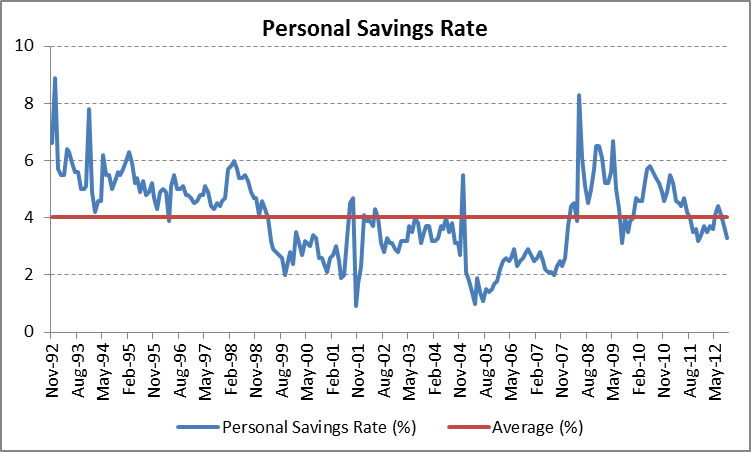 Consumers have already drawn down their savings rate to a level of 3.3%, so there is limited cushion to fall back on. 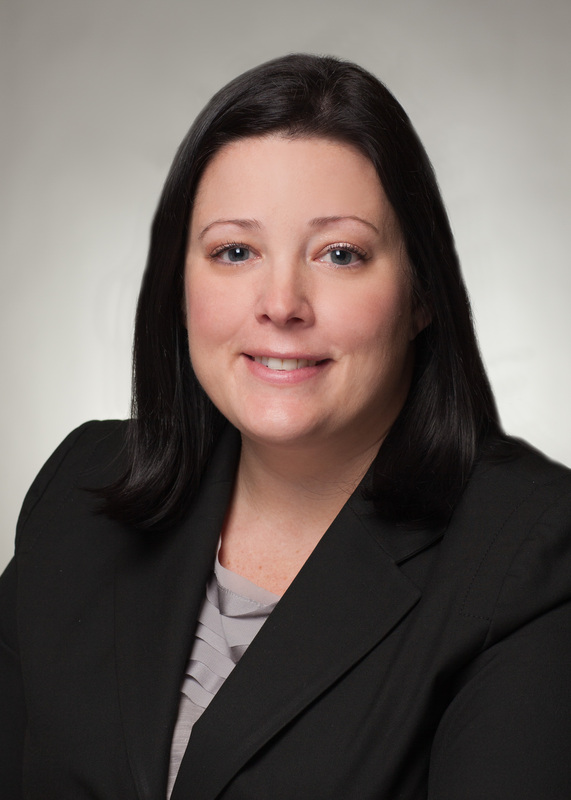 If the fiscal cliff does hit, it could result in further pressure on consumers, and serve dampen confidence.